We are in Guilin!!!! This has been an awesome (yes, truly AWESOME) trip! We took the school bus from Luxu to Suzhou, then took a train from Suzhou to Huang Shan (Yellow Mountain). Then from Huang Shan, we drove to Hanzhou and took a plane to Guilin. 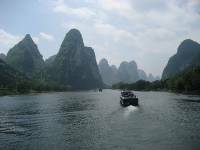 We spent a day travelling around Yangshuo, and then back to Guilin. Our tour is over, and we liked Yangshuo so much, we are heading back there today. I am currently sitting in WADA hostel, and it is pouring rain... My breakfast is waiting. As soon as I can, I will write more, and upload photos. It has been a fantastic trip. I hope everyone comes to this part of China if you can. It is stunning.